First held in the Newport Community Centre last year, Mick is staging this exhibition in three local reserves on over three weekends in December to raise money to support the purchase of the endangered littoral rainforest above Porter Reserve, Newport, so that it may be integrated into the adjoining Attunga and Porter Reserves. There has been much community concern about the possible development of this bushland. In May 2018, Pittwater Online News was contacted by residents who were concerned the land would be covered with inappropriate development and the loss of endangered species habitat for fauna. A campaign launched by residents, backed up by a petition quickly attracted thousands of signatures. Although the land has been taken off the market at present, the community is still pressing forward with supporting the acquisition and adding to the reserves in Pittwater to enhance fauna connectivity and green spaces for residents to enjoy as part of the Crown of the Hill to the Sea bushlinked paths in Newport. In August a Motion that Council write to state and federal members requesting funding to assist with the purchase of the subject lands was unanimously passed. 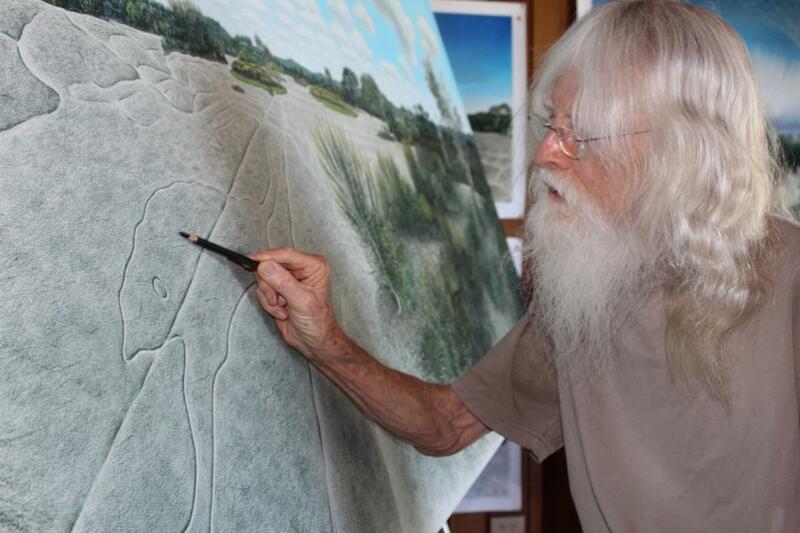 Local residents have so far raised $75,000 to support the acquisition of the land and Mick is hoping to push this to at least $100,000 with sales from the exhibition. The exhibition will begin in the Governor Phillip Park, Palm Beach for the weekend of December 1/ 2, move to Porter Reserve, Newport for December 8/9 and end on the waterfront outside Pasadena for December 15/16. The paintings will be displayed outdoors on easels and works on paper in a specially constructed pop-up art gallery. The art works are the result of 20 years of painting the bush landscapes of the northern beaches - evoking the Aboriginal presence in the land. To make the paintings, Mick has developed a unique process of working with different media and technologies: Drawings done on site in the bush with pen and ink on large scrolls of paper are digitally scanned and printed on paper, then taken back on site and worked on in colour with paint and oil pastel, scanned and printed again on large format canvases, worked on again with paint and oil pastel - and finally a digital file is created to be experienced in 360 3D virtual reality with 360 surround sound bird music. Also showing will be Dancing with Strangers, Mick’s first History painting - depicting the first encounter of Europeans with Aboriginal people on the shores of Pittwater in March,1788 when they both danced together. The exhibition will begin at 2pm on Saturday December 1 in Gov. Phillip Park, Palm Beach with a smoking ceremony - and will be opened by eminent Yuin Elder Uncle Max Dulumunmun Harrison.